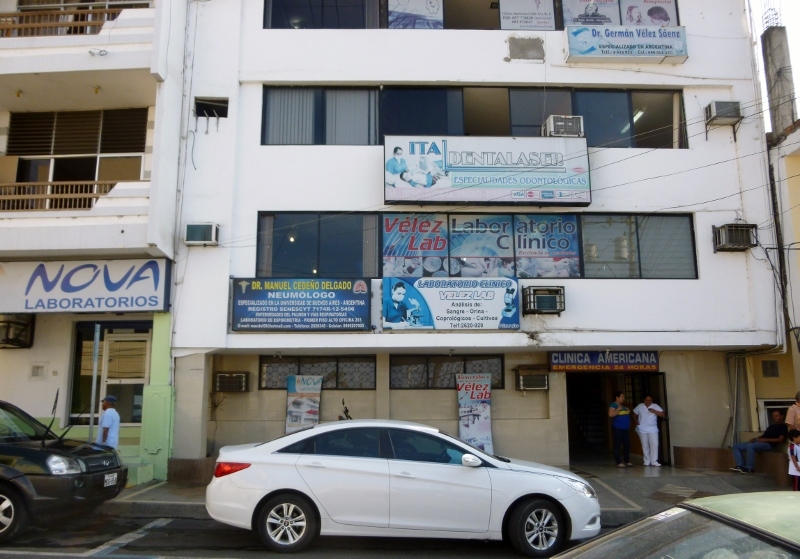 Manta, Ecuador isn’t a pretty city. At its heart it’s a small fishing village that has grown into a substantial metropolis with an estimated 300,000 citizens. Although the city has existed since Pre-Columbian times, there are no cultural ruins and little aesthetic appeal in the gritty commercial downtown. Narrow one-way streets climb up and down the steep hills attended by sidewalks in need of repair as crowds of vendors and shoppers move in opposing directions and swirls of activity. The vast majority of the downtown, one or two blocks set back from the waterfront, consists of relatively new and unimaginative structures: two, three and four-story cement and cinderblock square buildings, predominately gray or in need of a new coat of paint, their sides plastered with posters and signs. If the architectural term “Eastern Bloc” existed it might well apply to this portion of the downtown. 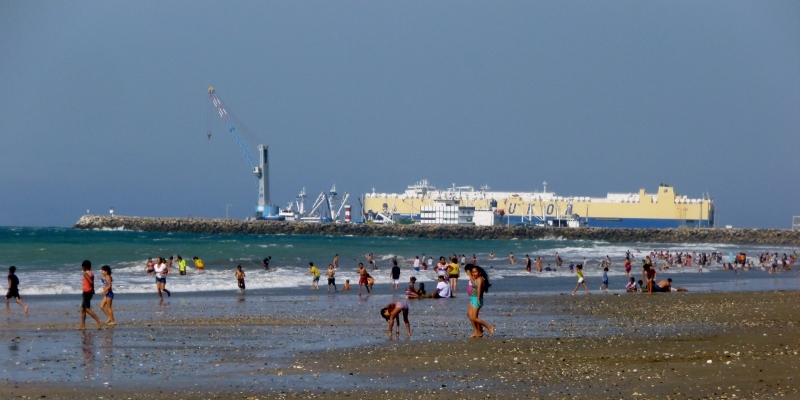 In contrast, the Malecon, the main street abutting the Pacific, running along the beach from Playa Murcielago eastward to roughly Playa Tarqui, hosts recent, modern, commercial edifices of glass and steel of several stories. Here are the larger banks, government buildings, hotels and the like. But, regardless of where you are in the city, tower cranes, arc welders and cutting torches attest to the fact that the city is in a genuine boom phase, both commercial and residential. 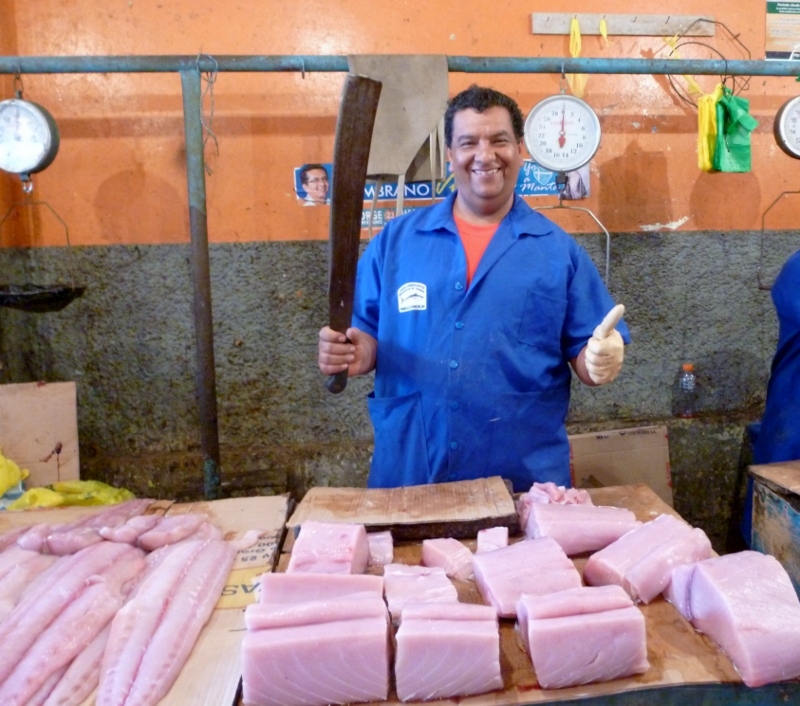 Manta has the largest seaport in Ecuador as well as one of the most stable economies in the country; fishing, tuna processing and canning are the main industries. We half expected the city to reek of fish but this wasn’t the case. 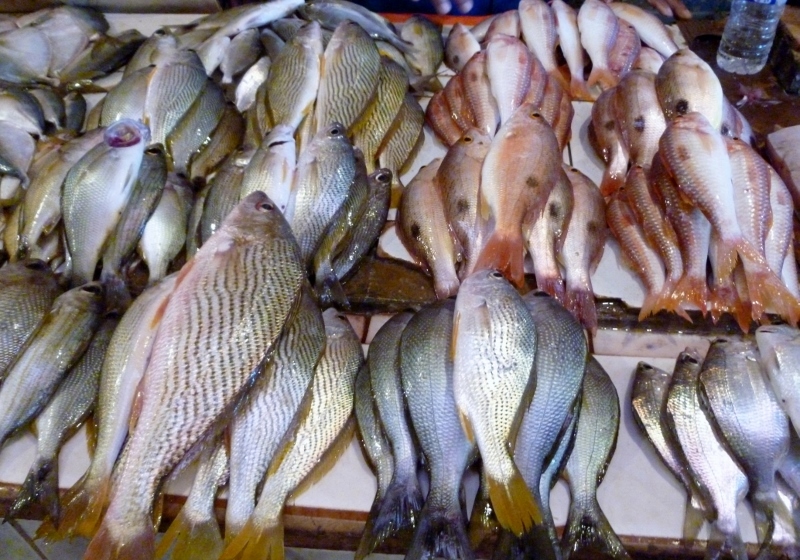 The fish market, a huge open-air structure roofed in tin and located on the beach was worth several morning visits. Tables were piled high with more varieties of fish than we had ever seen (tuna, dorado, corvina, red snapper, grouper, wahoo, prawns and lobster, etc.) with the fresh catch of the day glistening under stray shafts of sunlight. The flash of machetes and fillet knives slicing through the sea’s bounty and the salty smell of the sea and fish in the air gave us a new appreciation of an ocean harvest. Mid-day, after the crowds depart, the market is washed down; later on in the day it might turn rank, but there are the scavengers (frigates, egrets, herons and buzzards) waiting their turn to help with the final cleanup. 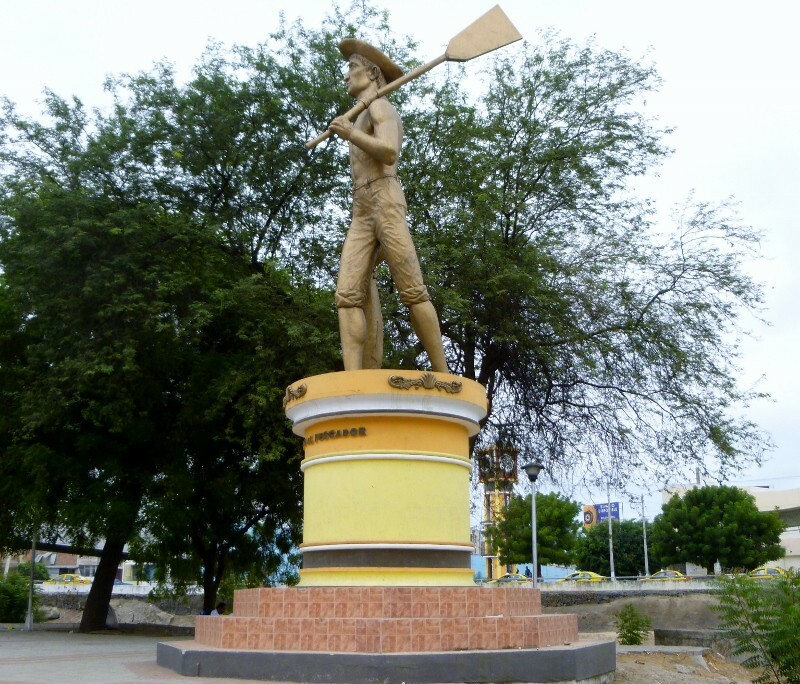 At three roundabouts on the Malecon sculptures are erected that reflect Manta’s roots as a village of fishermen and seafarers. 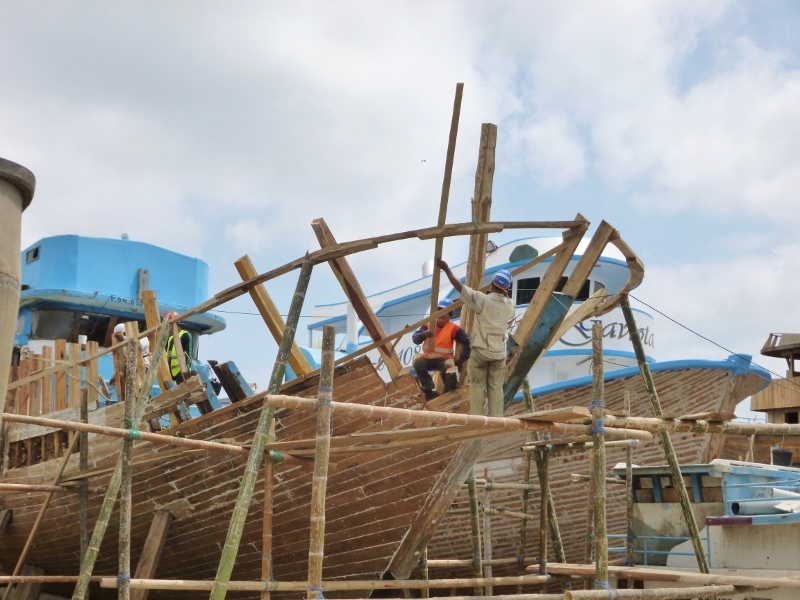 Here, also, we watched the skilled boat builders of Manta craft their handmade ships and, near the Manta Yacht club, we admired the yachts and other ships and boats floating in the bay. Tourism, both foreign and domestic, is becoming more and more important to Manta’s economy; assorted cruise ships make Manta a port of call. 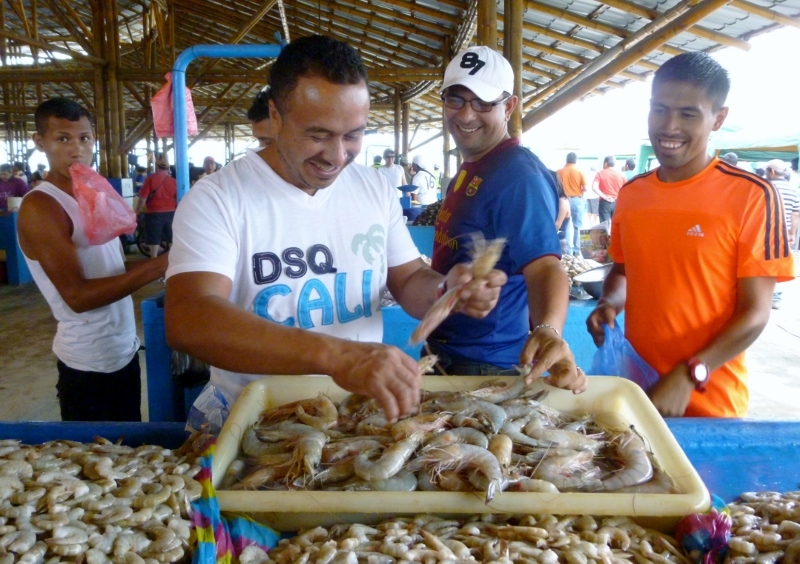 When the ships are in port, local vendors from the city and nearby Montecristi as well as those from the mountain cities of Quito and Cuenca set up their tables and display their handicrafts, textiles and artwork from many of the country’s finest artisans. 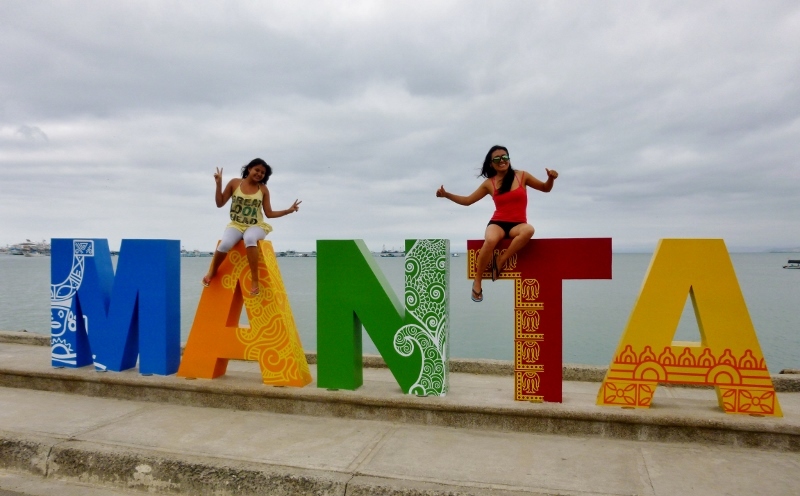 The citizens of Manta were some of the most welcoming and friendly people who we’ve yet encountered. Although the expat numbers are growing (estimated to be around 350) the ratio of gringos to locals makes this one of the most “authentic” places we’ve been. Taxi drivers were friendly and we had many conversations in Spanish, and occasionally English, as we were speedily delivered to our destinations. We made many friends in the active expat group which met several times during the week and our social life varied only with our desire to participate in the many gatherings or seek some quieter pursuits. And, while conversations of religious philosophies might be tolerated, political discussions could be volatile and engaging in such was best avoided. Manta’s an easy city in which to live and it’s only going to improve. It has beautiful beaches and the influx of affluent Ecuadorians looking for vacation homes, foreign speculators seeking a good investment and retiring baby boomers searching for a place where their money goes further are spurring the growth of this city. The availability of fresh produce and seafood at economical prices is unsurpassed and the city abounds with excellent restaurants. Garbage pickup is daily and there’s good cellular service as well as cable TV and, depending where you reside, excellent Wi-Fi. The electricity costs appear to be much lower than Central America’s and there’s even an airport. However, our ninety-day visa was close to its expiration date and it was time for us to move on. And, lest we sound like an ad for International Living, Manta’s not for everyone and it’s probably not for us. The dry climate that results from the offshore Humboldt Current gives Manta a mild and very pleasant temperature which draws many expats seeking to avoid the torpid humidity of Mexico and Central America. However, the aridity combined with the constant wind and dust can also cause a lot of respiratory problems for people predisposed to breathing difficulties (what the locals call gripe) and the rainfall, which would clean the air, is erratic and scant. It was usually cloudy during the months that we were there (September through November) but when the sun shone the skies were dazzling. We genuinely felt like we were leaving an old friend when we boarded the plane bound for Cartagena, Colombia. I think there must be some wonderful seafood restaurants. Sometimes this sort of off the beaten path locations lets you really connect with the locals. While we like the areas that draw tourists (after all we like famous landmarks, UNESCO World Heritage Sites and beautiful places) it’s great to be able to have the luxury to travel slow and settle into an area that the tourist hordes miss! And you’re right, it gives us a chance to interact with the locals, strike up a conversation or exchange smiles. Although this will probably not land on my bucket list, I enjoyed your post tremendously! Thanks Carol. Ecuador appeals to many people but, aside from the Galapagos, you’re right in the fact that it doesn’t land on a lot of bucket lists! This was a very interesting post. International Living has also started coming up on my reading radar and it certainly rates Ecuador highly.Nice to hear your perspective. Ecuador consistently comes up in the top 10 countries that are attracting foreign retirees looking to live better on less. What’s really great is that there are so many diverse climates and you can choose between mountain cities like Cuenca (altitude at about 7500) or Quito (even higher at 9,000 plus), small villages with expat communities like Vilcabamba in a mountain valley or several coastal cities. All of them have active expat communities who have found reasons they wanted to settle there. I enjoy reading posts like these, and especially because I really don’t know a lot about Ecuador, or for that matter, South America. I’m not sure it’s a city that I’d want to spend a lot of time in, but I would definitely check it out. I laughed at you references to “International Living” magazine. They have been hot on Ecuador for a while! We used to read International Living before we started traveling and they were just starting to get interested in Ecuador. It’s a fun magazine to get the dream of traveling and living in a foreign country going but… We’ve been to many of the countries and cities they write about in their magazine and it’s readily apparent that they’re only telling the rosy side of the story. The fun of travel is that we get to decide what our story is! I always enjoy the atmosphere of fishing ports, although the smell can sometimes be offputting! 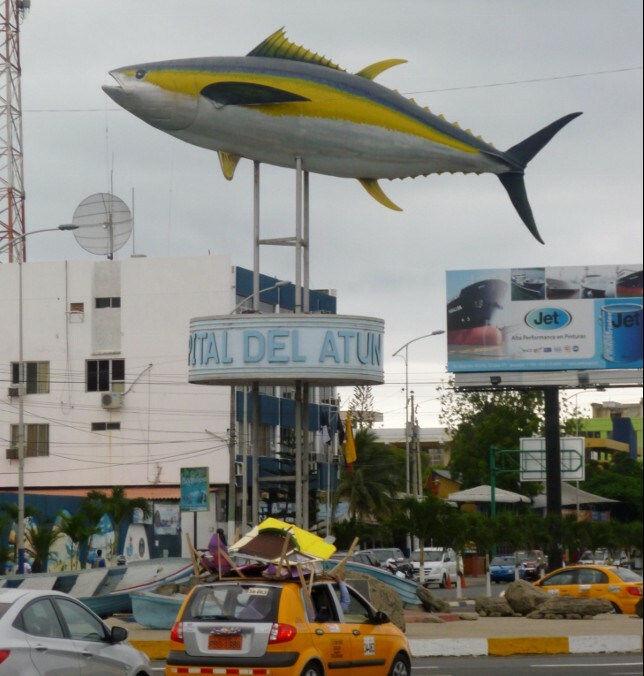 Sea and fishing ports are interesting and Manta has many things happening at its port from the fishing boats casting off and returning with a catch, to the opening of the fish market and selling of the fish, to the building of the boats following traditional building methods. Whole hours can be whiled away! I’d never heard of Manta. We love fresh fish and the ocean. Perhaps we’ll check it out at some point. Usually when magazines or bloggers mention Ecuador, the colonial cities of Cuenca and Quito are mentioned with very little written about the coastal cities. However, many of these cities are steadily growing, improving their infrastructure and services and steadily attracting foreign investors and retirees looking for a different lifestyle, a new adventure or ways to stretch their retirement dollars. Manta is definitely worth a visit! Manta definitely looks like an interesting place to visit and all that fresh seafood would make the food scene pretty tasty. 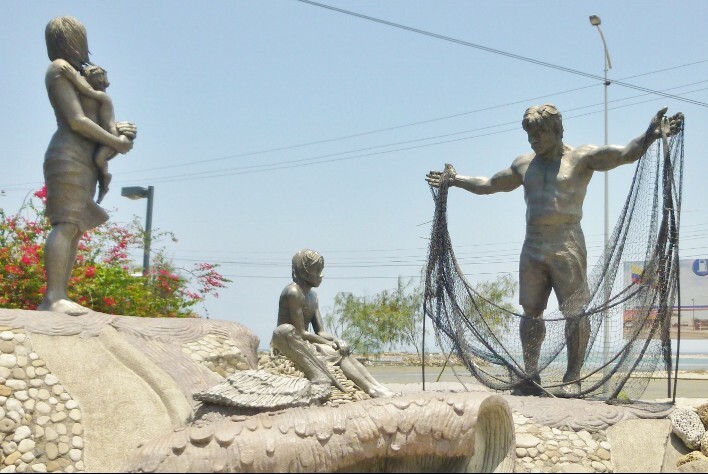 That sculpture of the fisherman with the net is interesting…he’s so muscular and with his square cut hair and clothes I thought at first glance it was a statute of The Hulk, which would definitely make Manta even uniquer than it is. Upon looking at the sculpture of the fisherman again I can see the resemblance to The Hulk (right before he goes on a rampage!) The fisherman and family sculpture is representative of the whole fishing culture that is at the heart of Manta and its superb seafood. I’d never heard of Manta before reading your post, Anita. Thx for sharing. We really did enjoy exploring Equador. We limited our exploring to the coast of Ecuador and, of course, the Galapagos Islands. There’s the whole interior to visit as well as the colonial cities and so many places left to see that we might have to make a return trip. It really is an amazing country! Luckily, we never experienced the fish smell (must have always been upwind!) and Manta has some strong arguments in its favor that draw people to this city. The variety of fresh produce and seafood is fabulous and really makes this city stand out from almost every other Central and South American city where the food is mildly seasoned and the choices can, many times, be limited. One of our favorite questions when meeting expats is “How did you end up here?” and it’s always a great conversation starter. Most of the people we’ve met who have settled into their adopted countries have been very happy with their choices and eager to tell visitors their stories as well as the reason they selected where they’re living. Manta was no exception and quality as well as cost-of-living was a huge factor. As for politics … In the US talking about politics is so fractious it really is best to avoid the subject. Maybe we need to start boning up on European politics … ! Thanks, Suzi! Manta has some very fine points and it really is worth a look-see at the areas around it as well as the amazing beaches. 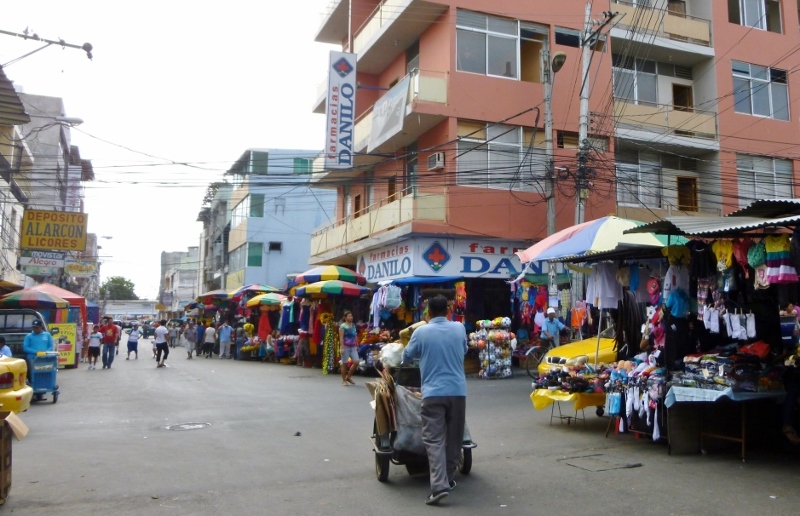 The people are lovely and the city is growing fast as more foreigners and wealthy Ecuadorians buy either their vacation condos or homes for retirement. I am living vicariously through your ventures. Leaving for Belize next week and I will be pleased to give you a report. My best wishes for a happy and healthy NewYear. We rode a bus through Belize on our way to Guatemala and later stayed in Placencia for a few days to reset our visas and thought Belize was beautiful. However, the infrastructure is still way behind a lot of Central America and it’s also expensive! I’ll be interested to hear your impressions, Maida! Sounds like in Manta it’s all about the fish. Fish and beaches! 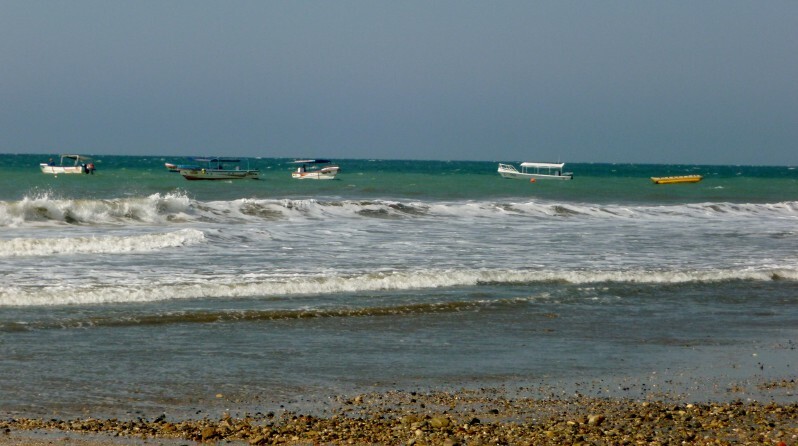 We never tired of either the amazing fresh seafood or the beautiful beaches in and around Manta. Another friend had mentioned being greeted at the Manta dock with the pervasive fish smell. Guess we were lucky to visit in the morning or else the wind was blowing away from us! This looks like a place just to relax and enjoy and of course have some amazing seafood, but as far as culture and history, it seems to be lacking which be a short term visit for me also. You’re right about Manta’s lack of culture and history although many ancient Incan ruins are only a few hours away and the colonial cities of Cuenca and Quito are amazingly rich in architecture, history and culture. It’s lovely to have a gorgeous beach nearby but we also like a city that has its history proudly displayed. I’d wondered if Manta might be a possibility for a longer term stay, as we prefer being by the ocean as much as possible. We’ll definitely have a look when we get to SA, but I’m guessing we’d prefer a wetter climate. We also are drawn to cities on the ocean or nearby as we love being on the water and listening to the surf. Manta is definitely worth a look as it’s an easy city to feel at home in and beautiful ocean-side property is affordable. 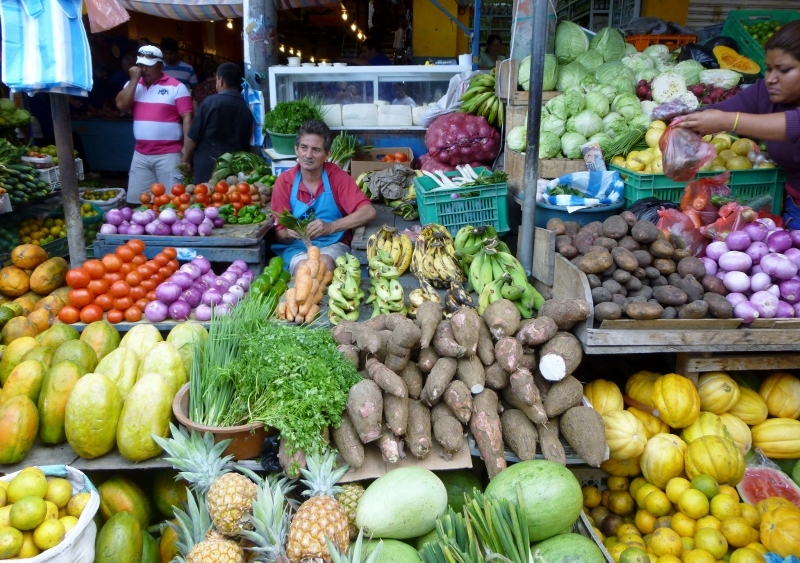 Unlike so much of Central and South America the variety of fresh food is amazing and Ecuador’s cost of living is LOW! I don’t think you could ever be an ad for International Living. lol Another fantastic report. Thanks. When we first started researching traveling and living in another country the magazine, “International Living” kept coming up on our reading radar. Sure it’s exciting to think about all the lovely places where you can live for much cheaper and the magazine will definitely give you a lot of ideas but… As you well know, even in a paradise like your island of Ometeppe, reality intrudes and it’s important to write about the negatives too.